Provides direct exit from each stall, for safety in case of emergency and for easily moving horses outdoors. Gives an opportunity for greater cross ventilation in each horse stall. Allows for the creation of turnouts or runs connected to each stall. Exterior stall doors typically consist of a sliding or hinged door located in the back of each stall. The door opens up to the outside of the barn. To be able to contain the horse while still having the door open, a stall screen is added to the inside of the door. The stall screen and exterior door operate independent of one another for maximum versatility. An exterior stall door is a single unit that can either be placed in the open or closed position. A dutch door is a hinged door in which the top of the door can be opened or closed independently of the bottom of the door. Dutch doors have two hinges and two latches. 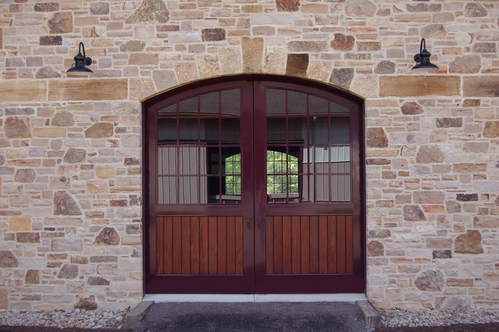 Any type of exterior stall door or dutch door can be held in the open position by adding a door holdback on the exterior of the barn.